This also marks for the first time in the history of our industry that these leading cloud providers are working together in the same open source focused foundation to move the state of the art infrastructure forward. Also last week I had the opportunity to bring in two new high quality cloud native projects into CNCF. Envoy is a high-performance open source edge and service proxy that makes the network transparent to applications. Jaeger is an open source distributed tracing system inspired by Google Dapper paper and OpenZipkin community. It can be used for tracing microservice-based architectures. Uber began deploying Jaeger internally in 2015. It is now integrated into thousands of microservices and recording thousands of traces every second. Anyways, this is one of the reasons I enjoy working in open source today, bringing together diverse (and even competing) companies to build a better world by collaborating in the open! In the last year or so, we have seen companies like AWS build out an open source program via @AWSOpen and even companies like VMWare hired their first Chief Open Source Officer. We’ve had many organizations approach TODO Group members asking for advice on how to get started with an open source program and these guides are a reaction to that. It is our hope that these are living guides and evolve with community input over time. Outside of relevant container standards finalized, another thing that was enabled by this v1.0.0 release was an interesting IP Policy (OWFa v1.0) embedded in the OCI charter. Essentially, there is patent non-assertion and royalty free patent grant made by all OCI members against the entire 1.0.0 specification implementations, not just their contributions! This is simply good news for the industry when it comes to what I call establishing an “IP no fly zone” for core container technology, which should spur further container adoption. Also, standardization also helps implementors and tool builders feel safe that things won’t break, which has been a bit of a challenge given how fast container technology has been moving. Please encourage qualified folks to apply, the deadline is September 5th. It’s been a little over a year and a half since I started to help build the Cloud Native Computing Foundation (CNCF) from scratch. One of our original goals was to build a modern open source foundation focused on a new form of cloud computing called “cloud native” (essentially think of microservices that run in containers that are orchestrated) and to get all the major cloud providers at the table to adopt this form of computing. First off, it’s always great to see an original vision of when we started CNCF come into reality, you can read more from Adrian Cockcroft why they decided to join CNCF and support cloud native computing. Second, I think it’s great to see a company like Amazon expanding its open source efforts as they where one of the last large companies without a formal open source program. They recently started an official open source program office @AWSOpen under the leadership of Adrian Cockroft and Zaheda Borat and it’s been great to have them participate in the TODO Group too! Anyways, always great to see large and impactful companies increase their commitment to open source. Now it’s interesting to think what large companies out there don’t have an official open source program or strategy (I’ll leave this as an exercise to the reader). In early September, CNCF will be announcing the founding class of Kubernetes Certified Service Providers (KCSPs). If your company provides professional services to support Kubernetes deployments, please consider signing up to become part of the founding class. The CKA exam is about to enter early release beta testing prior to the public release in September. It is an online, proctored, performance-based test that requires solving multiple issues from a command line. It takes 3 to 4 hours to complete, and costs $300, though a discount is available for beta testers to $100. at the top of that page. them. Within a week, we will send beta test dates, a discount coupon code, and instructions to register and schedule. If you are not already on it, and want to track progress of the certification program over time, please subscribe to the Kubernetes Certification Working Group list: https://lists.cncf.io/mailman/listinfo/cncf-kubernetescertwg. Thanks to everyone who voted in the community! 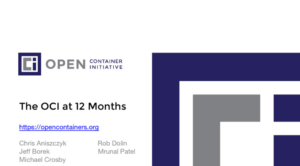 Last year I had the opportunity to help build out/run the Open Container Initiative (OCI) and I wanted to take some time to reflect back on what the OCI community accomplished in 2016 and how far we’ve come in a short time since we were founded a little over a year ago. The community has been busy! The project saw 3000+ commits from 128 different authors across 36 different organizations. With the addition of the Image Format specification project, we expanded our initial scope from just the runtime specification. Our membership grew to nearly 50 members and we also added new developer tools projects —runtime-tools and image-tools— which serve as repositories for conformance testing tools and have been instrumental in gearing up for the upcoming v1.0 release. We’ve also recently created a new project within OCI called go-digest (which was donated and migrated from docker/go-digest). This provides a strong hash-identity implementation in Go and services as a common digest package to be used across the container ecosystem. In terms of early adoption, we have seen Docker support the OCI technology in its container runtime (libcontainer) and contribute it to the OCI project (as runc). Additionally, Docker has committed to adopting OCI technology in its latest containerd announcement. The Cloud Foundry community has been an early consumer of OCI by embedding runc via Garden as the cornerstone of its container runtime technology. The Kubernetes project is incubating a new Container Runtime Interface (CRI) that adopts OCI components via implementations like CRI-O and rklet. The rkt community is adopting OCI technology already and is planning to leverage the reference OCI container runtime runc in 2017. The Apache Mesos community is currently building out support for the OCI image specification. Speaking of the v1.0 release, we are getting close to launch! The milestone release of the OCI Runtime and Image Format Specifications version 1.0 will hopefully be available this first quarter of 2017 or shortly the following quarter, drawing the industry that much closer to standardization and true portability. To that end, we’ll be launching an official OCI Certification program once the v1.0 release is out. With OCI certification, folks can be confident that their OCI-certified solutions meet a high set of criteria that deliver agile, interoperable solutions. We’ll be looking into the possibility of adding more projects in the coming year, and we hope to showcase even more demonstrations of the specs in action under different scenarios. We’ll be onsite at several industry events, so please be on the lookout and check out events page for details. There is still much work to be done! The success of our community depends on a wide array of contributions from all across the industry; the door is always open, so please come join us in shaping the future of container technology! In particular, if you’re interested in contributing to the technology, we recommend joining the OCI developer community which is open to everyone. If you’re building products on OCI technology, we recommend joining as a member and participating in the upcoming certification program. Note: This was cross-posted to the OCI community blog. The default GitHub code review experience has always been lacking for me, especially when it comes to code review enforcement. I definitely admit to my bias of being a Gerrit code review fan but at least GitHub is moving in the right direction with recent code review improvements earlier this year. On the bright side, GitHub has a fairly open API and there’s been a great ecosystem of tools that have popped up that help deal with some of the shortcomings in my opinion. Even more so after GitHub opened up the commit status API, it’s definitely enabled some interesting workflows. As a bonus, the “signed_off_by” setting can be used to enforce DCO which is to make sure your commits are properly signed off for DCO purposes. I also want to give an honorable mention to LGTM which is a simple pull request approval system that is open source but not as configurable as PullApprove IMHO. 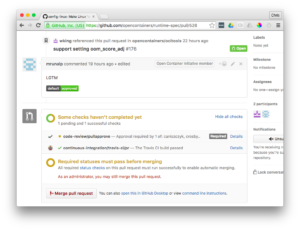 For any large scale and high velocity projects on GitHub, managing what you need to review can be a daunting task. 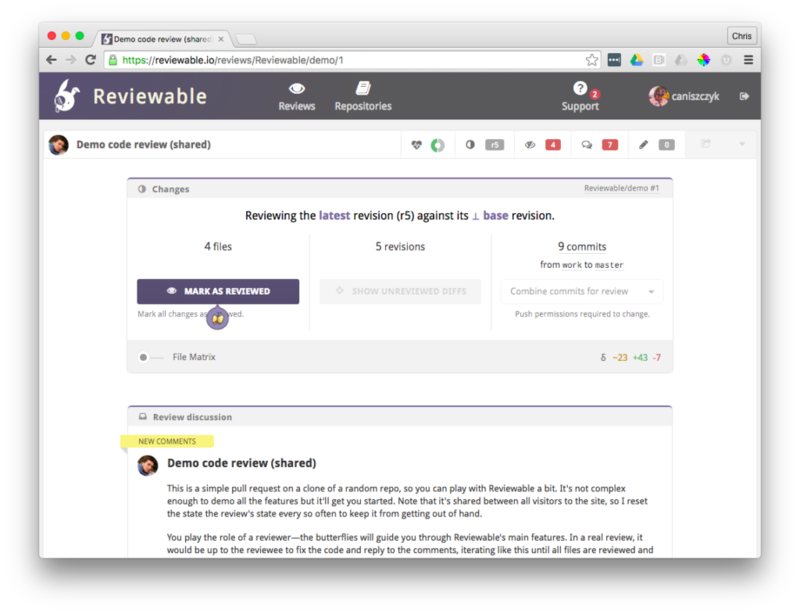 I’ve personally found Reviewable.io as an interesting tool that helps address the problem of managing the context of what you looked last and what’s on your queue. Anyways, hope this helps and happy code reviewing! If you’re interested in more integrated GitHub code review tools, I highly recommend checking out the GitHub integration directory.